Hi all, if you have any questions or comments on the new B+ board, please add them here! The most noticeable addition is an extra two USB ports, which is achieved by replacing the old ethernet/USB 2 port hub chip with a four port version. Hand in hand with this is better power circuitry so the ports can now supply more power, which should help with hotplugging and high power devices (USB Hard drives should now work). All connectors are now on two sides of the board, and there are now mounting holes at each corner. So, evolution rather than revolution, in order to maintain as much backwards compatibility as possible. Hopefully most of the points that people have complained about over the last couple of years have been addressed! New thread - repeated question. I like most of the changes, but has some functionality been lost? Can somebody confirm whether the P5 GPIO28-31 are still available. They are not shown on the schematic. Last edited by PiGraham on Mon Jul 14, 2014 8:56 am, edited 1 time in total. PiGraham wrote: New thread - repeated question. 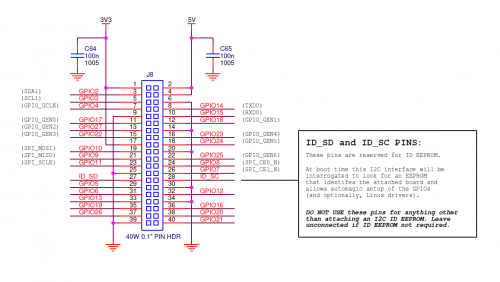 GPIO18-21, ALT0 is I2S. The other functions on 28-31 are available on other pins in the 0-27 range that is brought out on the GPIO header. The function table is on page 102 in the BCM2835 ARM peripherals datasheet. "Better hotplugging and usb power"
Does this mean we'll be able to hot plug high power devices like wifi without the power inrush rebooting pi ? Please can you clarify the PSU specifications ? I have ordered a B+ and a 2A PSU, rather than use my existing 1A, to be covered..
What is the board revision number as reported by /proc/cpuinfo ? Is there a complete list somewhere of all revision numbers that have ever been used? Does the new power supply circuitry make the Pi more tolerant of input voltages on the microUSB? What voltages are now ok to feed into the microusb power input? For example is 6v now safe? Hows the i2c eeprom for board function going to be used, will there be config files for the bootloader etc? The Geek Gurl video in your blog post announcing the B+ mentions that the built-in audio is "improved". Is this correct? mikerr wrote: "Better hotplugging and usb power"
fruitoftheloom wrote: Please can you clarify the PSU specifications ? The B+ is now "inrush proof" against hotplug, even to the point of connecting a short across VBus to GND. What it won't fix is a weak power supply - it is still theoretically possible to brown out the Pi to the point of a reboot if the PSU is not up to the task. The default current limit setting for the USB ports is 600mA (aggregate across the 4 ports). This can be increased to 1.2A via software config if you have a sufficiently powerful PSU. Note that the PWR LED is now connected to an undervoltage supervision chip. The PWR LED will flash (or go out) if the PSU voltage drops below ~4.63V. shuckle wrote: What voltages are now ok to feed into the microusb power input? For example is 6v now safe? joan wrote: Does the new power supply circuitry make the Pi more tolerant of input voltages on the microUSB? The specified acceptable input voltage range is 4.75-5.25V. The B+ is more tolerant of lower input voltages due to the 100% duty cycle capability of the 3.3V/1.8V switcher, if you don't care about USB devices dropping out. DoctorH wrote: The Geek Gurl video in your blog post announcing the B+ mentions that the built-in audio is "improved". Is this correct? GadgetUK wrote: Hows the i2c eeprom for board function going to be used, will there be config files for the bootloader etc? Not much point discussing it as the specifications and software support hasn't been written yet. But they are GPIO0 and GPIO1, I2C0. I'm going to put money on the same question being asked at least once more in this thread after it's dilluted with more questions that have been previously asked. Still PWM but with improved SNR [if so: achieved how?]? Or a different output method? PWM is still used to generate the audio output - but now there is a dedicated supply rail for audio (which means it's completely clear of digital cruft) and dedicated output driver. The output impedance is a lot less than the B, and the output DC blocking caps are now 47uF which makes 32-ohm headphones useable in terms of bass response and volume. Because I had to wait until I could check the schematics and because it makes sense to keep the q&a in one thread. Since it's been released on Bastille Day (the greatest day in the cyclists calendar) should the "Raspberry Pi B+" be know as the "Raspberry Pi Bastille"? jdb wrote: PWM is still used to generate the audio output - but now there is a dedicated supply rail for audio (which means it's completely clear of digital cruft) and dedicated output driver. Excellent. Thank you for the extra info! This is fantastic. A very elegant design. Stacking a "plate" on to those 4 mounting holes is going to be beautifully robust. It's great to see that big fragile power supply capacitor has gone away. Well, I'm sure there is one but damned if I can see where. Apple will be sending the Foundation a snotty letter about the rounded corners ! Any documentation about what alternate functions are available on the new header pins? Heater wrote: Any documentation about what alternate functions are available on the new header pins? By my count, everything that is in the chip's peripheral set minus one of the auxiliary SPI interfaces (SPI2). This includes several undocumented interfaces currently described as "reserved" in the BCM2835 peripherals datasheet (one day...). Edit: One exception, in addition to ID_SC and ID_SD. GPCLK1 is reserved - do not use. It feeds a clock to the LAN9514 and tampering with this will likely result in USB not working any more. According to the CPC website the GPIO pins have been extended from 26 to 40 it also claims that it's backwards compatible with existing 26 pin projects. How can this be considered "backwards compatible" ?? Would it be possible to remove pins 27 and 28 without crippling the functionality of the GPIO?? I've also noticed the presence of inductors and MOSFETs around the micro USB port, am I to understand that the LDOs have been replaced with switching bucks?? It is still using the BCM2835 SoC as are all Pi varieties, but the circuitry has been redesigned.. In the words of the Master ""This isn’t a “Raspberry Pi 2″, but rather the final evolution of the original Raspberry Pi""
I would say the new 40 pin header is backwards compatible enough. One of the launch videos does show a Raspi break out board mating to the new header without issue. I'm sure such connectors can be used everywhere else. I guess to be truly backward compatible as you suggest would require keeping the old header and adding a new one nearby leaving enough space for any old connectors. I very glad the expansion was not done that way. the 40 pin header solution is far more elegant.